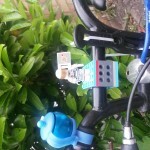 Fit a Lego minifigure to your children's bike (or your bike), just because you can. In the world of children, motor vehicles are everywhere. Shelves and shelves of books are dedicated to diggers. Most Lego kits are motor vehicles, one way or another. Kids are encouraged to stop and look at tractors. Kids are encouraged to get excited about cars. Toys for young children are commonly trucks. 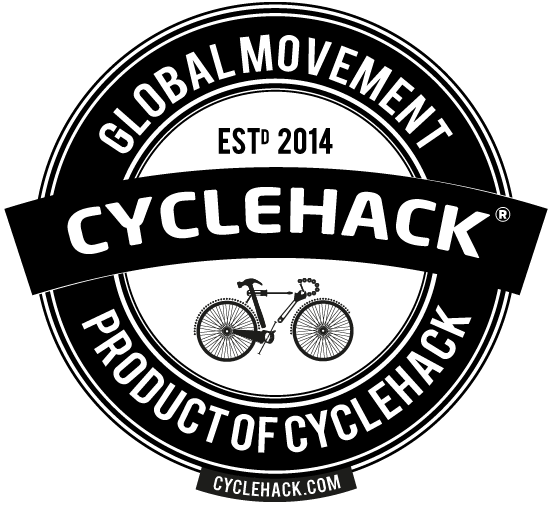 Then there's the songs; we sing "the wheels on the bus" but not many of us sing about bicycles. I have three children, aged 9, 7 and 5, and I do what I can to right the imbalance but I get fed up with the prevalence of motor vehicles in kid culture! 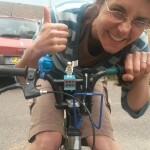 So I made this Lego kit thinking that, if it survives testing, then I'll make up kits to give as presents - hopefully that'll give kids a reason to demand to ride their bikes! The detailed fit probably depends on the individual bike. In the one shown, I used two 6 x 4 baseboards, four pieces of 4 x 1 technics blocks (with the holes in, although in fact the front two could be ordinary blocks), four thin 4 x 1 pieces, two smallish cable ties and the Lego minifigure. 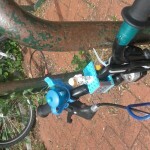 The picture shows the make up; the cable ties go through a rear Lego piece, around the handlebars, back through the other rear Lego piece. 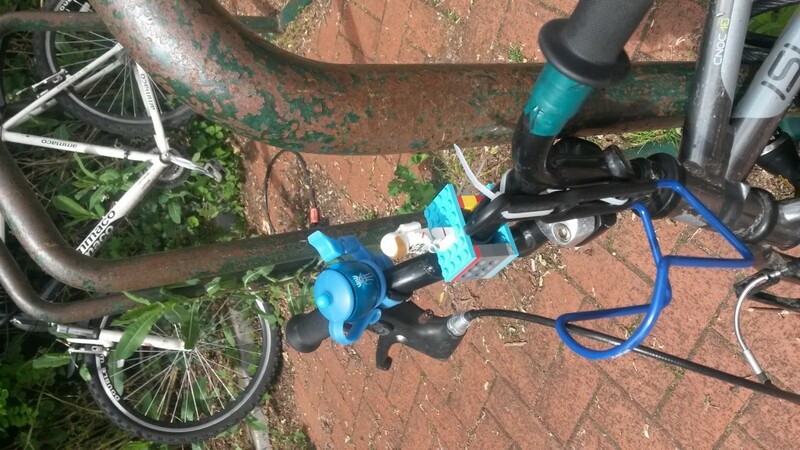 Other configurations of Lego and cable ties didn't really work, but this has been robust enough to survive a two mile round trip on pavements (except that the flag was too wobbly). My five year-old is very pleased with riding with his Tim Peake Lego minifigure, and I think he'll be the envy of his friends! I started out thinking about what are the barriers to cycling for my children's friends. Aside from all the obvious big problems, one medium-sized problem is that there is a gap in the market for kids' bike lights. That got me thinking about Lego, as we've got a Lego torch. The torch didn't work, but that made me think about putting on a minifigure, just for a laugh. So I did!